Shredding services will destroy sensitive docs using mobile shredding at your site, pick up boxes from your location, or will shred at their local location if you drop paper off. 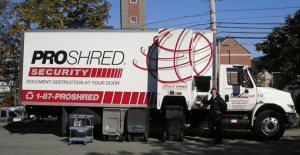 These three national paper shredding services–Iron Mountain, ProShred, and Shred-it–specialize in heavy duty shredding. Here we compare their pricing, services offered and customer satisfaction. * Pricing may vary in some markets. Iron Mountain is the king of document management. With locations nationwide it’s usually easy to find a location near you. 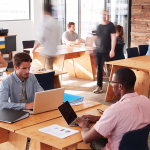 They have a highly secure process and great number of options to fit small business needs, especially if off-site shredding is what you need. Between the 3 national competitors, Iron Mountain has the best rates for off-site shredding. This is the type of service where Iron Mountain picks up your paper in a locked bin or vault and brings it back to their location for shredding. If you’re just scheduling a one-time shredding, the cost is $99 for one 96 gallon bin and $40 for each additional bin of paper. Shred-It, on the other hand, charges a flat $125 per bin, so it can get expensive fast if you have a lot of paper. There’s also a big discount if you sign up for regular monthly or bimonthly off-site shredding. The cost is $65 for 2 bins (or 1 bin + 1 secure vault or console) plus $16 for each additional bin or console. Iron Mountain also has on-site paper shredding services, which is where they bring out equipment and shreds at your office. It’s a little more secure than off-site shredding and sometimes necessary if you need a witness present. The cost is $10 per box (standard copy-size) with a minimum charge of $300. Iron Mountain has a strong A+ rating from the Better Business Bureau. However, while this may be expected for a business their size, I found a lot of negative reviews on Yelp. 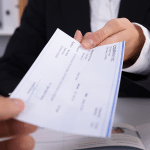 In particular users complained about all sorts of hidden fees they weren’t aware of until the bill came: administrative fees, late fees, rush job fees, carton retrieval fees, permanent withdrawal termination fees, and others. With this in mind, it’s probably worth a look at the fine print before signing up for regular service. If you’re near one of their service locations has the lowest price for on-site shredding, especially for regularly scheduled service. ProShred focuses specifically on on-site shredding. ProShred also has better reviews than other competitors. ProShred has by far the best rates for on-site shredding, which is actually the only type of paper shredding service they offer (aside from small drop-off service). At $85 for 1 bin and $40 for additional bins, they cost a fraction of the price of Shred-It ($150 per bin) and can be much cheaper than Iron Mountain considering their $300 minimum. If you sign up for regularly scheduled service, the cost is even lower at $45 (1 bin) + $40 for each additional bin. These prices may vary depending on the location. One downside, however, is that they’re a smaller service and they are not available in every city. ProShred has 27 locations nationwide, including New York, Los Angeles, Chicago, Houston, Dallas/Fort Worth, Philadelphia, Phoenix and more. Most major cities are covered, but you may be out of luck in a smaller city. Perhaps because they’re a smaller service, ProShred actually has much better reviews than their competitors. Browsing through Yelp, I found almost all positive reviews on their various locations. The only negative thing I found was somebody who lost touch with a salesperson while trying to schedule an appointment. Shred-it is larger than ProShred and smaller than Iron Mountain. They are the most expensive of the three and don’t have great reviews. They are most appropriate for drop-off shredding since they are offer it and are less expensive than ProShred. Shred-it offers the whole array of paper shredding services, including off-site and on-site shredding, as well as the option to drop off paper at their office. Their pricing is on the more expensive end: Iron Mountain beats them at off-site shredding and ProShred beats them at on-site shredding. Part of the reason is that Shred-it charges a flat rate per bin – $150 for on-site shredding, for example. So if you had 5 bins of paper, you’d pay $600 for Shred-it compared to only $285 for ProShred. They do, however, offer a low cost drop-off service. At $10 per box or bag, you can drop off paper at one of their centers for shredding. Shred-it has a solid A+ rating from the Better Business Bureau. Like Iron Mountain, however, I found a lot of negative reviews on Yelp. Rather than hidden fees, their biggest issue seems to be reliability. A lot of users complained about Shred-it employees showing up late or canceling without notice. The above services are for businesses who need to purge lots of old records. If you just need sporadic shredding or don’t shred a lot you may want to go with some the other available options. Paper shredding services vary greatly from one company to another. Whether you need on-site, off-site, or drop-off services combined with where you’re located will determine your best shredding company options. 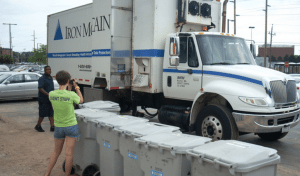 If you need off-site shredding or you’re not in one of the major cities your only option might be Iron Mountain (which could be through Fedex of UPS drop-off). If you are in a major city and want to do on-site shredding, ProShred is probably the better option. You might also just want to forego a service altogether and invest in your own shredding machine. If so check out our article on the best paper shredder. Thanks for the write up on paper shredding services. Would you be interested in covering SMEs that do shredding as that may provide a different quality of fit for local businesses. Please let me know as I’d be happy to make some recommendations for a variety of metropolitan cities. I think our readers could always benefit from additional research. Do you have a list of smaller/independent/local shredding services you could link us to? Use Vanish Document Shredding – They do secure shredding for free and recycle -any size volume. Thanks for dropping in. How does pricing compare to Shred-It, Iron Mountain and ProShred?